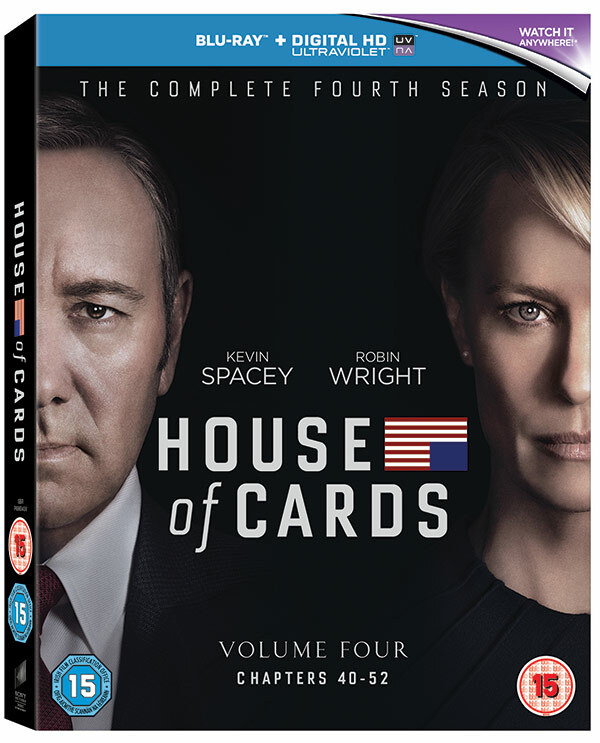 COMPETITION: Win House of Cards season four on Blu-Ray! Two-time Academy Award winner Kevin Spacey returns for season four of the critically-acclaimed political thriller, House of Cards, which is released on DVD and Blu-Ray from today (July 4). After season three closed with the conniving President Frank Underwood (Spacey) winning Democrat support in Iowa at the loss of his greatest champion – his equally clever wife Claire (Robin Wright), we have been filled with suspense. Could the man who manipulated himself to the top job in American politics be on his way back down? Season four of House of Cards will see Frank reassert his claim on the Presidency the only way he knows how: through lying, scheming and outwitting the other players of the seedy game he calls politics. House of Cards‘ fourth season has received critical acclaim, scoring 86% fresh on Rotten Tomatoes and 76% on Metacritic, with some critics suggesting it is the best season so far. To celebrate the release of House of Cards‘ fourth season on DVD and Blu-Ray, we’re offering TVGuide.co.uk users the chance to win one of three Blu-Ray boxsets of season four. For your chance to win, all you have to do is answer the simple question correctly below. (If you can’t see the survey above, click here). This competition closes on July 18, 2016. Only open to UK applicants. The winner will be selected at random from all entries. Please see full Terms and Conditions here. House of Cards season four is available from today (July 4) on DVD and Blu-Ray.